We’re back for our 3rd annual Winter  Sessions and it’s gonna be a huge one! 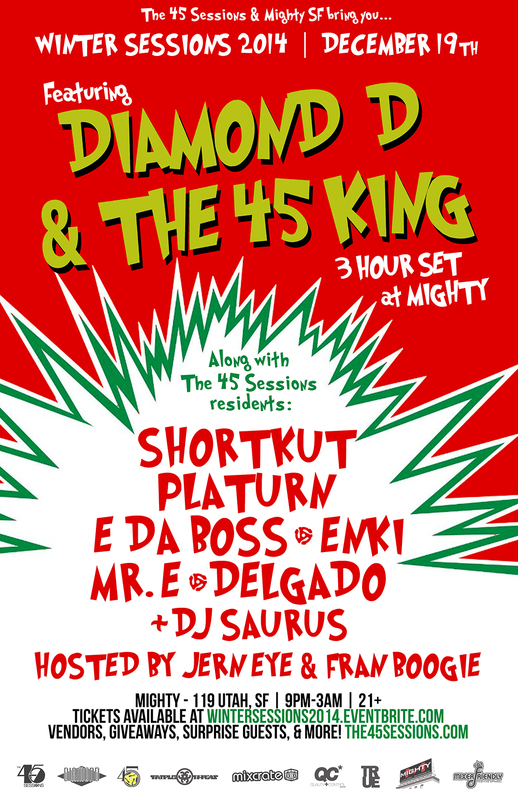 Grammy award winning legendary producer/djs THE 45 KING & DIAMOND D are joining us this time around for a night of all 45s madness on one of the best sound systems in Northern California, the almighty Mighty in SF (oh, and did we mention they’re playing for 3 whole hours)! So much in store for the night — check the info below and get ready for that real. We will have a holiday bazaar in the side room all night as well as DJs so get there early and bring cash and get your X-Mas shopping on!